The round arch was the foundation of Rome’s architectural mastery and massive expanse of building projects across the ancient world. 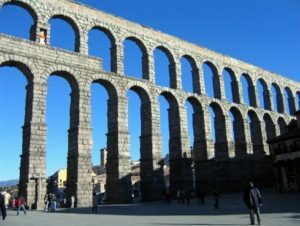 It allowed the Romans to make bigger buildings, longer roads, and better aqueducts. 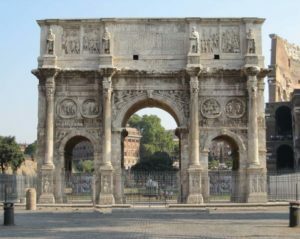 The Roman arch is the ancestor of modern architecture. The arch was first used in the Mediterranean world by those in Mesopotamia, Greece, Persia, and ancient Italy. While these cultures had the arch, they rarely used it except for underground tunnels and drainage systems, where the force of the earth around it provided natural buttressing, or reinforcement. 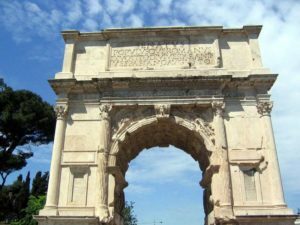 The Romans learned the arch from the Etruscans of Tuscany and were the first people in the world to really figure out how to use it. 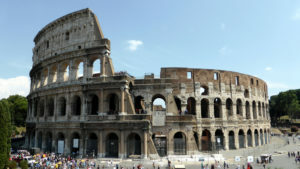 Romans in the first centuries BC discovered how to use arches in the construction of bridges, aqueducts and buildings. The Roman arch is largely responsible for the expansion of infrastructure across the Roman Empire. The Roman arch became a foundational aspect of Western architecture and generated new systems of building across Europe. An arch is an architectural form that controls the pressure from the weight of a building in a specific way. The arch directs pressure downwards and outwards, creating a strong passage underneath it that has the ability to support heavy structures. This is called compressive stress, because the pressure of the weight is compressed by the shape of the arch. Because the stress is directed both down and outwards, walls or other structures were often required to reinforce the arch. The arch allowed ancient builders to make larger, more complex buildings that could hold more space and people. 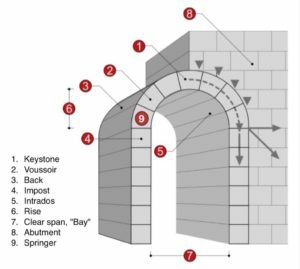 The central feature of an arch is the keystone, or the wedge-shaped stone at the very top of the arch. It is the last stone placed during construction, and it locks all the other stones of the arch into position. The keystone bears almost no weight, but is the center of redirecting the weight of the structure down and outwards. The Romans used arches with circular tops, called rounded arches, which were made of stone. A series of rounded arches side by side is called an arcade. 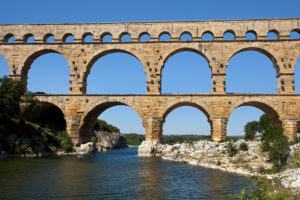 Bridges and Aqueducts, one of the foremost uses of the arch in building was for bridges and aqueducts. When roads or pipes needed to cross an area without level terrain, say a valley or river, an arcade of arches gave them the support they needed to sustain their weight off the ground. This was extremely important in the development of Rome. 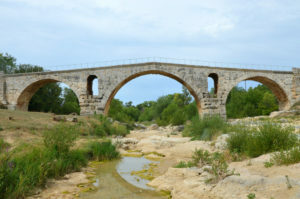 Without bridges to connect their roads, the Roman army would not have been able to march across Europe, expanding the Empire. Theatres & Amphitheatres, the Roman theatre was of course inspired by the Greek version, but the orchestra was made semicircular and the whole made using stone. The Romans also added a highly decorative stage building (scaenae frons) which incorporated different levels of columns, projections, pediments, and statues. Amphitheatres were used for various types of public events. 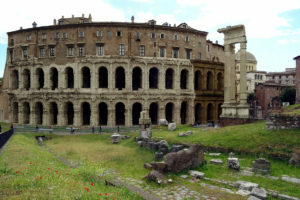 Ancient Roman amphitheatres were circular or oval in shape, and used for events such as gladiator combats, chariot races, venationes (animal slayings) and executions. About 230 Roman amphitheatres have been found across the area of the Roman Empire. The earliest Roman amphitheatres date from the middle of the first century BC, but most were built under Imperial rule, from the Augustan period (27 BC-14 AD) onwards. Imperial amphitheatres were built throughout the Roman empire; the largest could accommodate 40,000-60,000 spectators. The best-known amphitheatre in the world is the Roman Colosseum, which is more correctly termed the Flavian amphitheatre (Amphitheatrum Flavium), after the Flavian dynasty who had it built. 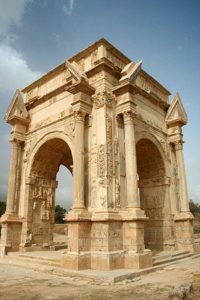 Triumphal Arches, the triumphal arch, with a single, double, or triple entrance, had no practical function other than to commemorate in sculpture and inscription significant events such as military victories. Early examples stood over thoroughfares – the earliest being the two arches set up by L.Stertinius in Rome (196 BCE) – but later examples were often protected by steps. Topped by a bronze four-horse chariot, they became imposing stone monuments to Roman vanity. The Arch of Constantine (c. 315 CE) in Rome is the largest surviving example and is perhaps the last great monument of Imperial Rome. Arch of Septimius Severus, Rome. 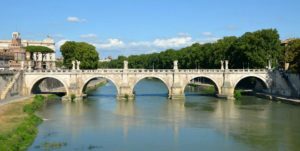 The Romans were undoubtedly the first people to build large and lasting bridges. Testament of the building techniques of Ancient Rome can be witnessed even today with hundreds bridges still standing. 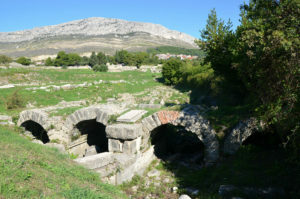 Croatia, in the east suburb of Salona, outside the walls enclosing the old city, the Urbs vetus, the westernmost backwater of the Jadro (the ancient Salon) was flowing. In the 1st century BC it was spanned by a five-arch bridge supported by massive pillars. It was constructed from finely chiselled stone blocks arranged in a regular pattern and bound with mortar. The bridge was situated on an important regional road which was a continuation of the old city’s main communication, the decumanus maximus. France, the Pont Julien, owning its name to the nearby city of Julia Apta (modern-day Apt), is a beautiful three-arched bridge spanning the Calavon River. Today, it is located close to the town of Bonnieux. It was originally built in 3 BC on the Via Domitia, an important Roman road that connected Italy and Spain through the Roman province of Gallia Narbonensis. 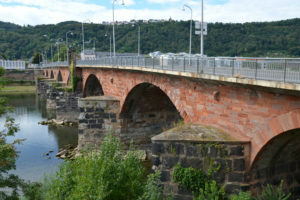 Germany, the Roman Bridge in Trier spans the Moselle. It is the oldest standing bridge in Germany. The nine bridge pillars date from the 2nd century AD. The upper part was renewed twice, in the early 12th and in the early 18th century, after suffering destruction in war. It is designated as part of the Roman Monuments, Cathedral of St. Peter and Church of Our Lady in Trier UNESCO World Heritage. 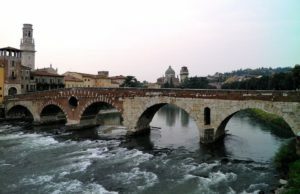 Italy, the Ponte Pietra (Italian for “Stone Bridge”), once known as the Pons Marmoreus, is a Roman arch bridge crossing the Adige River in Verona. The bridge was completed in 100 BC, and the Via Postumia from Genua to the Brenner Pass passed over it. Spain, the Roman bridge of Córdoba is a bridge originally built in the early 1st century BC across the Guadalquivir river, perhaps replacing a previous wooden one. 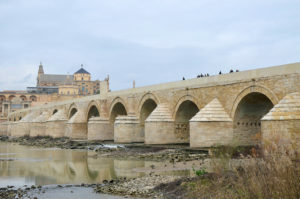 The bridge has been reconstructed at various times since and most of the present structure dates from the Moorish reconstruction in the 8th century.